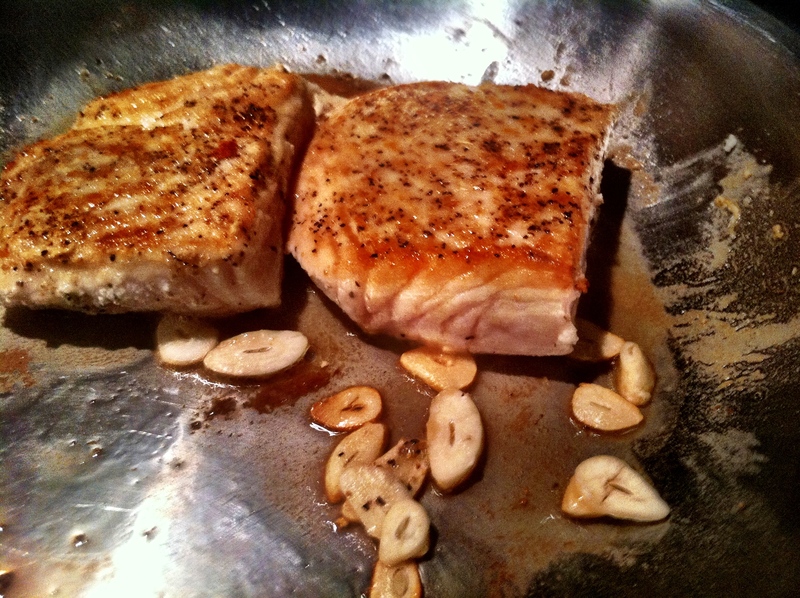 This is one of my favorite halibut dishes. 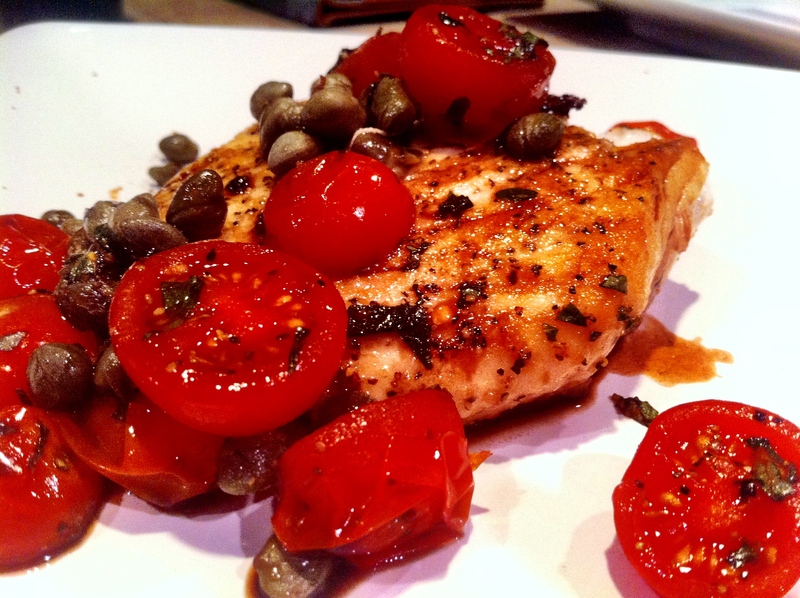 However, if you do not like capers, do not make this dish. The capers, along with the balsamic vinegar and cherry tomatoes is what brings this dish and all the complexities together. If you have a cast iron dish you will take the searing to the next level. For all you outdoorsmen out there, this is how you impress your wife. 1 pint of cherry grape tomatoes, cut in half. 2 medium garlic cloves, thinly sliced. Get your engine started and rev it up to 450 degrees. 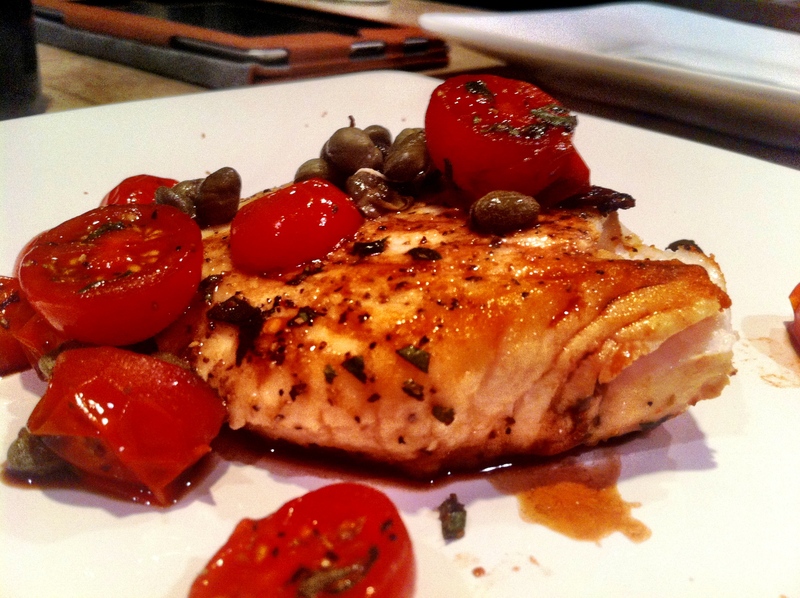 In a medium bowl, mix the tomatoes, capers, oregano, vinegar, 1/2 teaspoon of sea salt, and 1/4 teaspoon of black pepper. 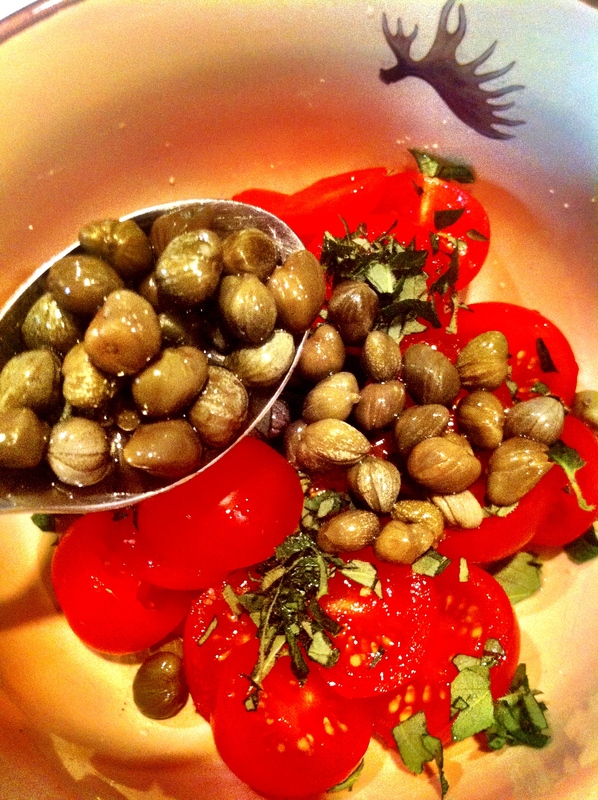 I didn’t chop my capers up because I love them and love the taste of them whole. That is one beautiful piece of fish, almost makes me cry knowing that I am going to eat it, or it is the garlic I just sliced up laying next to the fish. Dredge the fish in flour, and shake off any excess. 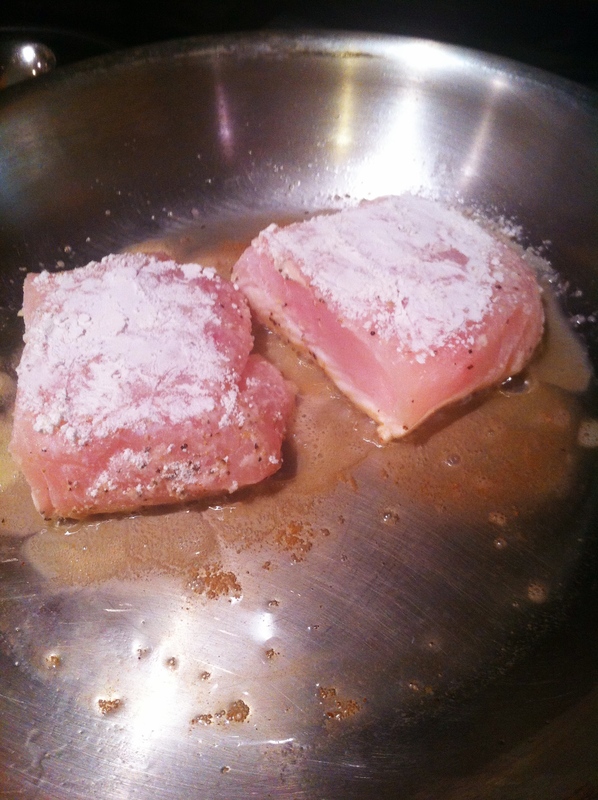 Heat your oil in your pan on medium high to high heat until its shimmering hot then add your fish evenly spaced. Cook them without touching until it browns and releases easily from the pan, you can gently pick up the corners to look, about 3 minutes. They are browning, and you need to not pick at it and look every 4 seconds. Trust yourself! Flip the fish, and sprinkle the garlic around it, and cook until the garlic just starts to brown, about a 45 seconds to a minute. 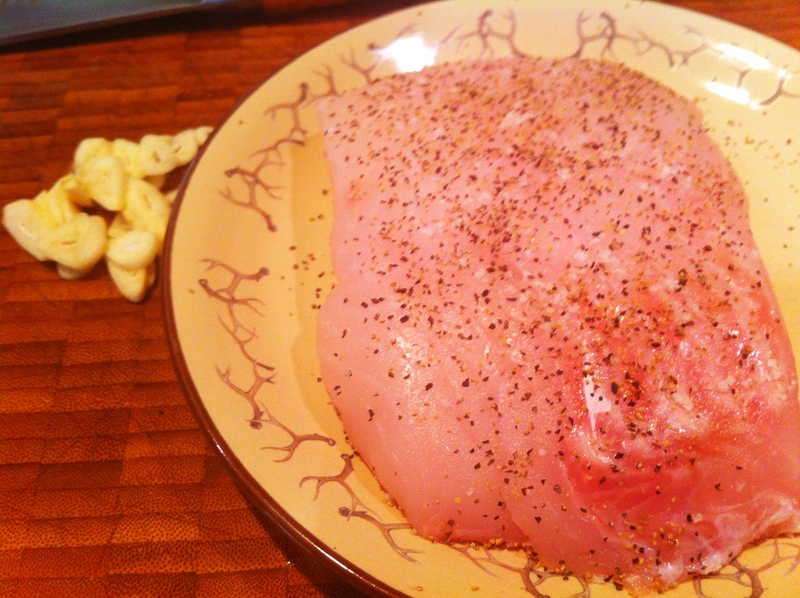 The halibut has nice color, that garlic is gonna pop in your mouth later. 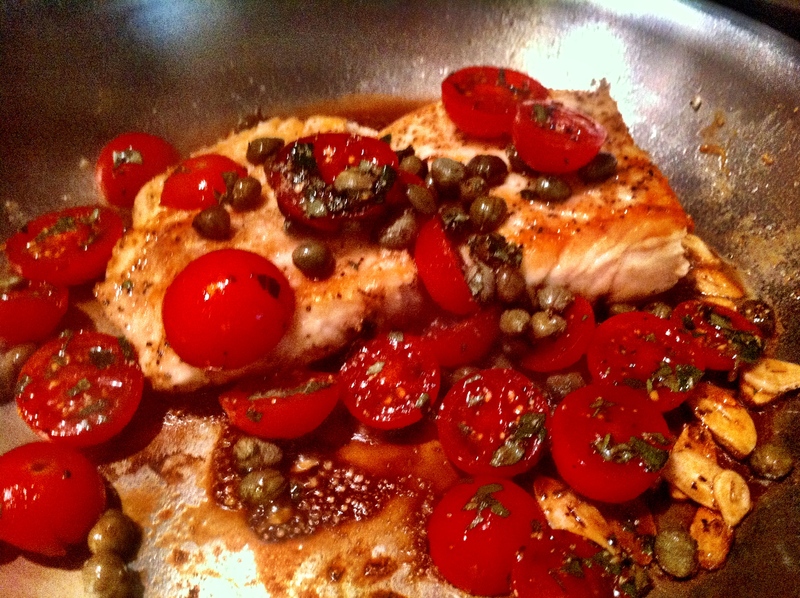 Pour the tomato mixture around the fish and transfer the skillet to the oven. Roast until the fish is just firm to the touch and opaque.  When you pry open a thicker piece with a paring knife, probably 4-6 minutes depending on the thickness of the fish. It should flake gently. Remove from the oven and plate it and spoon mixture over the fish. If you need a little more balsamic hit it with a dash, but be careful not to over do it. See the edge of the fish where I pried it open to check for doneness, right corner. You can serve this with salad of your choice on the side and you sir will be a rock star and your wife WILL MAKE YOU GO FISHING NEXT TIME. I am teaching you fellas on how to get your wives to kick you out of the house…one dish at a time. Plated and ready to roll.